Curly had a “fun” adventure in April. She was riding her bike outside with all her siblings and she had a terrible bike crash. She fell over sideways and her bike landed on top of her. My husband brought her inside screaming and I worked to clean her up. She kept complaining of pain in her leg and I could tell something was very wrong. A 4-hour trip to the ER later that night confirmed what I suspected – she had broken her leg. It was actually a spiral fracture. We spent the entire following morning at the office of an orthopedic surgeon who put on a long leg last on Curly’s left leg. That huge cast covered her leg from her toes to the top of her thigh. The next two days were terrible – Curly was in a lot of pain and required someone to carry her to the bathroom because she could not move with her giant cast. She spent those two days on the couch with her leg elevated and she even slept on the couch at night to be near us in case she needed help. So, we took a good week off of our homeschool. My hubby even took a few days off work to help me with Curly because she was not able to move from the couch without help – unless one of us carried her. And did I mention that we had just started potty training little Punkin about 3 days before the accident? I spent an entire week taking people to the restroom and running back and forth to get pain meds, snacks, drinks, pillows, and blankets for Curly. Life finally improved when we were able to get a small wheelchair for Curly so she could move herself around the downstairs without being carried. (And why no crutches you ask? Because the cast weighed nearly as much as Curly and when she tried to stand it pulled her over sideways. A wheelchair was the only feasible option). How do you homeschool when you are in a short-term crisis mode? Well, first, you take some time off to recover and regroup. 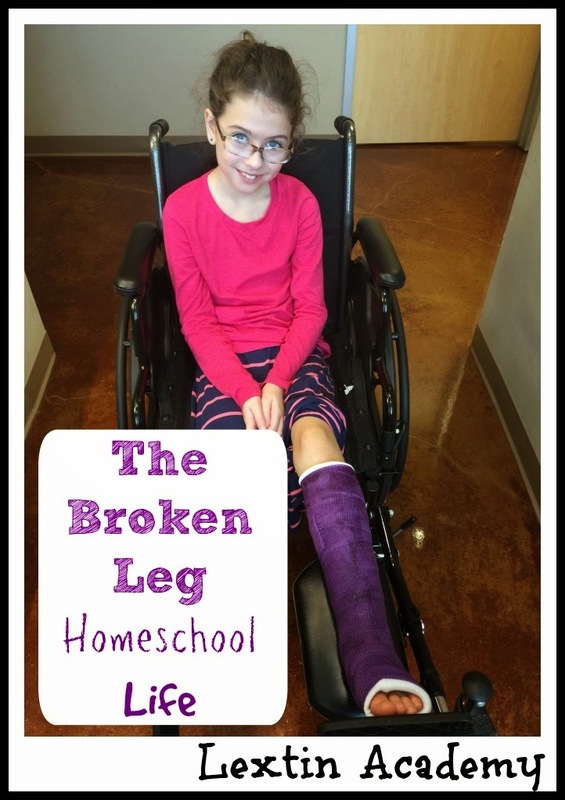 However, we were looking at about 8 weeks of Curly being in a cast so I knew we had to find a new “normal” in our homeschool. Our homeschool room is upstairs so that was out of the question for Curly. I moved all of her books and supplies downstairs to the living room book shelf. Every night I laid out some independent work at the kitchen table for Curly. When she woke in the morning she was able to get in her wheelchair and wheel herself into the kitchen to start some work until I came downstairs. I started waking Bee up early to do school first. After we finished, I worked with Tiger for a little while before breakfast. After breakfast I gave Curly a few more assignments and then went back upstairs with the rest of the crew. I finished school with Tiger and then let all the littles play together while I went downstairs to spend time with Curly. I worked with her until lunch when everyone joined us downstairs. Once lunch was finished, I took the little girls upstairs for some rest time and then I had the big kids come back downstairs to have reading time with Curly. They played with her in the living room with legos and coloring books while I read to everyone. We had to make some major adjustments to our school day while Curly was in her cast. And I will admit that we never finished a full school day for our first few weeks of trying the new schedule. Eventually Curly was able to have a shorter cast and learned how to use crutches with her new, smaller cast. I taught her how to get herself up and down the stairs and how to maneuver the crutches upstairs so she could get to her own room. Ohhh, and we got Punkin potty trained too! Those were some very busy weeks at our house!